As promised, here are the sources from my NTK 2008 sessions . Read the following blog entry, I tried to describe the concept in detail. Also, this blog post discusses issues when using large document parameters with reliable transport (WS-RM) channels. Also, versioned schemas for the Person document are shown, including the support for document validation and version independence. This blog entry describes the concept. All sources are in VS 2008 solution file format. 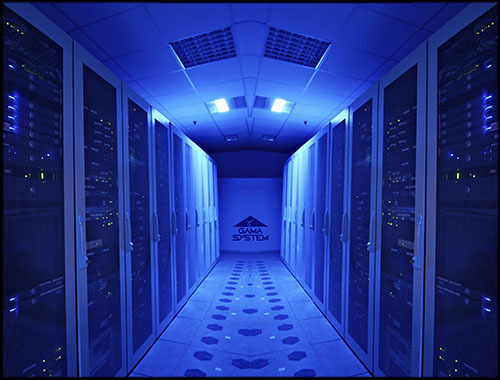 This transaction spans from the client, through the service boundary, to the server. There is a serious limitation present in the RTM version of WCF 3.0/3.5 regarding control of WS-RM retry messages during a reliable session saga. Let me try to explain the concept. We have a sender (communication initiator) and a receiver (service). When a reliable session is constructed between the two, every message needs to come to the other side. In a request-reply world, the sender would be a client during the request phase. Then roles would switch during the response phase. The problem arises when one of the sides does not get the message acknowledgement in time. WCF reliable messaging implementation retries the sending process and hopes for the acknowledgement. All is well. The problem is that there is no way for the sending application to specify how long the retry timeout should be. There is a way to specify channel opening and closing timeouts, acknowledgement interval and more, but nothing will define how long should the initiator wait for message acks. Let's talk about how WCF acknowledges messages. 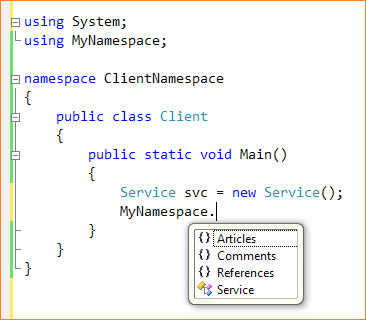 Request phase defines a sequence and sends the first message (a3). In response, there is the appropriate acknowledgement present, which acks the first message (b3) with Lower and Upper attributes. Lines b4-b6 define a benign and super useful WCF implementation of flow control, which allows the sender to limit the rate of sent messages if service side becomes congested. When the session is setup, WCF will have a really small time waiting window for acks. Therefore, if ack is not received during this period, the infrastructure will retry the message. Duplex contracts work slightly differently. There, the acknowledgement interval can be set. This configuration option (config attribute is called acknowledgementInterval) is named inappropriately, since it controls the service and not the client side. It does not define the time limit on received acknowledgements, but the necessary time to send the acknowledgments back. It allows grouping of sent acks, so that multiple incoming messages can be acked together. Also, the infrastructure will not necessarily honor the specified value. It does not matter whether the initiator is on a dial up, or the message is huge. The number of retry messages depends on the bandwidth and message size. It can happen that tens of messages will be sent before first acknowledgement will be received. A good thing is that there are undocumented algorithms implemented for retry timeout. The implementation increases the reply timeout exponentially when the infrastructure detects that the network conditions demand more time (slow throughput) and allows reliable delivery (no losses). If loses are present the reply timeout decreases. Retry timeout is actually calculated when establishing an RM session. It is based on the roundtrip time and is bigger if the roundtrip time is long. So, when first messages in a session are exchanged, don't be too surprised to see a couple of message retries. 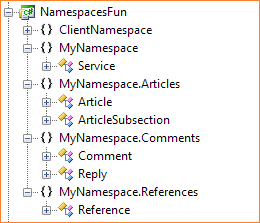 In WCF, collection data that is passed through the service boundary goes through a type filter - meaning you will not necessarily get the intrinsic service side type on the client, even if you're expecting it. No matter if you throw back an int or List<int>, you will get the int by default on the client. The main reason is that there is no representation for System.Collections.Generic.List or System.Collection.Generic.LinkedList in service metadata. The concept of System.Collection.Generic.List<int> for example, actually does not have a different semantic meaning from an integer array - it's still a list of ints - but will allow you to program against it with ease. 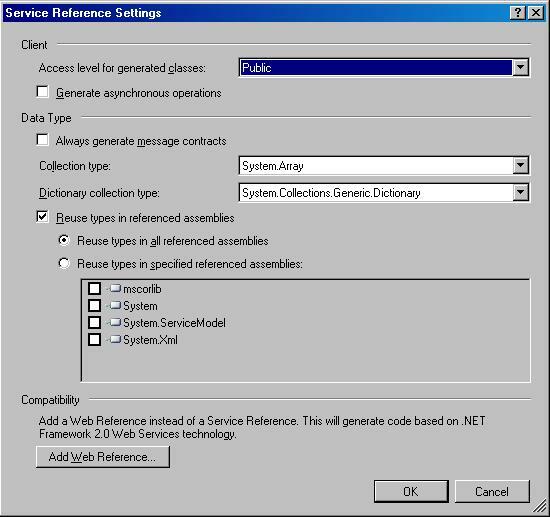 Though, if one asks nicely, it is possible to guarantee the preferred collection type on the client proxy in certain scenarios. Unidimensional collections, like List<T>, LinkedList<T> or SortedList<T> are always exposed as T arrays in the client proxy. Dictionary<K, V>, though, is regened on the client via an annotation hint in WSDL (XSD if we are precise). More on that later. ... then WCF will serialize the data to an array of the collections type. Note: Coin class should be marked either with a [DataContract] or [Serializable] in this case. So what happens if one wants the same contract on the client proxy and the service? There is an option in the WCF proxy generator, svcutil.exe to force generation of class definitions with a specific collection type. Note: List`1 uses back quote, not normal single quote character. On the other hand, dictionary collections, as in System.Collections.Generic.Dictionary<K, V> collections, will go through to the client no matter what you specify as a /ct parameter (or don't at all). Because using System.Collections.Generic.Dictionary probably means you know there is no guarantee that client side representation will be possible if you are using an alternative platform. 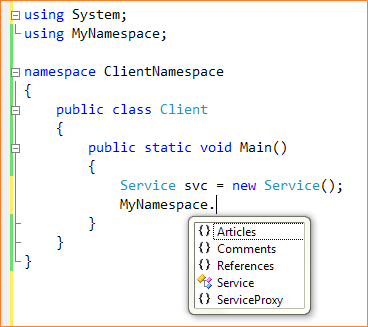 There is no way to meaningfully convey the semantics of a .NET dictionary class using WSDL/XSD. So, how does the client know? Note: You can find this schema under types definition of the metadata endpoint. Usually ?xsd=xsd2, instead of ?wsdl will suffice. The meaningful part of type service-to-client-transportation resides in <xs:annotation> element, specifically in /xs:annotation/xs:appinfo/IsDictionary element, which defines that this complex type represents a System.Collections.Generic.Dictionary class. Annotation elements in XML Schema are parser specific and do not convey any structure/data type semantics, but are there for the receiver to interpret. This must be one of the most excellent school cases of using XML Schema annotations. It allows the well-informed client (as in .NET client, VS 2008 or svcutil.exe) to utilize the semantic meaning if it understands it. If not, no harm is done since the best possible representation, in a form of joined name value pairs still goes through to the client. POX (Plain Old XML) support in Orcas is brilliant. Nice. I especially like the fact that ref and out parameters are serialized with the metod return value. Reach in with //EchoResponse/strString2 for ref parameter and //EchoResponse/strString3 for out parameter. Return value is available on //EchoResponse/EchoResult. Simple and effective.